In the early morning of Sunday, January 18, 2015, at the Sisters of Providence house in La Papalota, the scene was set for the first Providence Scholarship (Beca) Program gathering of 2015. One-hundred and twenty-five white plastic chairs had been placed in the Romero meeting room and on the ground under the terrace at the back of the open Romero room. Large tarps covered the terrace to provide protection from the hot Salvadoran sun. A projector and screen had been set up in the meeting room and tables and chairs placed on the front porch of the house. All was ready. The large front gate was opened and the 104 participants in the 2015 Providence Scholarship (Beca) Program began to arrive, coming from thirteen communities (villages) in the Bajo Lempa/Jiquilisco region. 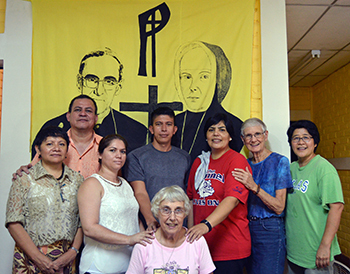 Sister Marita Capili, president of the Council of Administration for the Providence Beca Program, in collaboration with the members of the council (the Sisters of Providence serving in El Salvador) and the program staff, had planned well for this meeting. There was a reception table where each participant was welcomed and given a name tag. At other tables, they received their scholarship checks for January while submitting their grades from the previous semesters and providing information regarding their community service projects. Sister Marita led the students in an interactive review of the goals and objectives of the Providence Beca Program and of the criteria for receiving a scholarship. Transito Ruano-Castro, formation coordinator, reviewed the previous year’s formation themes: nutrition and health, family dynamics, social justice and diversity, self-esteem and fear of failure, human rights, sexually transmitted diseases. Transito invited the Beca recipients to participate in a survey regarding the formation themes they would like to have included in 2015. These students had submitted their applications for a scholarship in early December of 2014. This January gathering was the first of monthly gatherings that will take place this year. Because of the large number of recipients, the gatherings will alternate, with the 62 high school students meeting one month and the 42 technical school and university students meeting in the alternate month. Special guest observers at this meeting were the members of the visiting delegation from St. Aloysius Gonzaga Parish in Spokane, Wash. The delegation arrived as the students were registering. Before the meeting started and at the break time, delegation members and students had opportunities to test out their Spanish and English speaking skills in conversations with each other. After the opening prayer, Sister Marcia Gatica, serving as moderator, introduced the Council of Administration and the staff and then invited the members of the delegation from St. Aloysius Parish to introduce themselves. Tulio Mancia, technical consultant, explained the inauguration of the Providence Beca Program (PBP) Facebook page, which will be a principle communication tool for the program participants, staff and the Sisters of Providence. Tulio provided information for the participants to sign up on this exclusive Facebook page. Three former scholarship recipients were invited to share their experience with the Beca program. Each one expressed the importance of receiving an education, of persevering in spite of difficulties, and of becoming active and informed participants in their communities and in the larger society of El Salvador and the world. The social reality of El Salvador today is marked by the growth of youth gangs (pandillas), violence in the countryside and in the cities, and the consequent breakup of families. Providence scholarships in the Bajo Lempa/Jiquilisco region of El Salvador offer young Salvadoran women and men an opportunity to pursue an education and to mature as participative, contributing members of their society. For 2015, the scholarship program in El Salvador has a total of 104 recipients, ranging in age from 15 to 30, from 15 different communities in the Department of Jiquilisco. Forty-three are university/technical students in programs of study including nursing, medical doctor, education, law, engineering, social work, accounting, English, computer science and administration. Their monthly Beca assistance ranges from $80 to $175 based on their school, courses and educational stages. Sixty-one are bachillerato, or high school students with three years of courses to be completed before going to a university or technical school. In the beginning of the year, each student received $80, including $50.00 for tuition and the first allotment of $30 monthly for expenses such as meals, transportation, school supplies and Internet usage. Each scholarship recipient is required to maintain an average grade of 7.0 or higher, to perform six hours of social service in their community, and to participate in the monthly Beca meetings.